Build a medium-hot fire in a charcoal grill, or heat a gas grill to high. Purée basil, 3 tablespoons mint, and garlic in a blender. With machine running, add 1/2 cup oil. Set a strainer over a small bowl; strain, pressing on solids. Season with salt and pepper. Brush grill rack with oil. 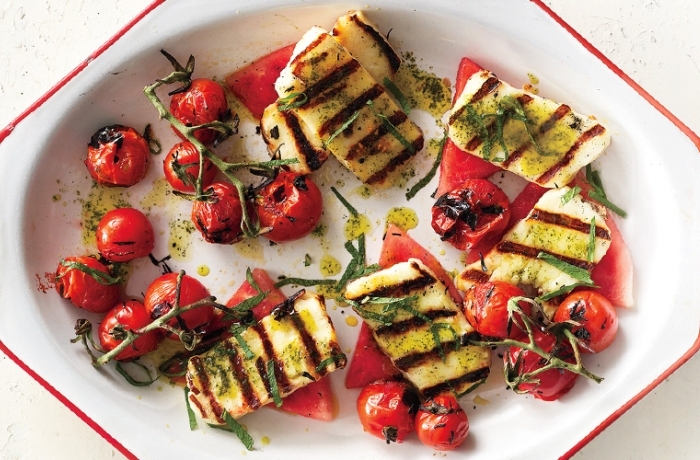 Drizzle 2 tablespoons basil-mint oil over tomatoes and cheese; season with salt and pepper. Grill tomatoes, turning occasionally, until charred and bursting, about 4 minutes. Grill cheese until nicely charred in spots and beginning to melt, about 45 seconds per side. Arrange melon on a platter. Top with cheese and tomatoes. Drizzle remaining herb oil over; garnish with sliced mint.